This episode of Paintball Tipps talks about the basic team tactic of the Bounding Overwatch. No matter what you try on the field there is one skill you must completely master before you can take your game to the next level. One skill more than any other will make you the master of woodsball or tourneyball - the "Bounding Overwatch". 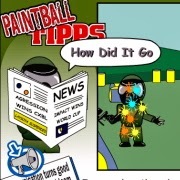 This is the third video in the Paintball Tipps series that we created to both educate new players, as well as, entertain the more experienced.